Disclaimer: In no way do I claim myself to be an expert in photography equipment or lighting. I don’t really know how they work technologically like an engineer, but I know which settings to modify on my camera and flash to achieve the desired results without understanding the nitty-gritty details of the technology. I’m a point and shoot kind of photographer and as long as it gives me great photos, I don’t care. For the last three years, I have been sporting the Cactus V4 Wireless Flash Trigger sold by Gadget Infinity. When I purchased them almost 3 years ago, I really didn’t know what to look for in a wireless trigger so I picked the one recommended by the Strobist blog since, apparently, that is what people were recommending for a cheap/eBay trigger. When they arrived, I fired off a few test shots, confirmed that they worked while the strobes were sitting on my laps and called it a day never touching it again for another 3 years. Little did I, know 3 years later, when trying to use these Cactus triggers that one of the triggers has a really poor range of 2 feet. I later resolved this problem by using quality alkaline batteries instead of rechargeable NiMH batteries. Apparently, 1.2 Volts of the rechargeable versus the 1.5 Volts of a regular alkaline cell made an enormous difference in the performance of the Cactus V4 receivers. 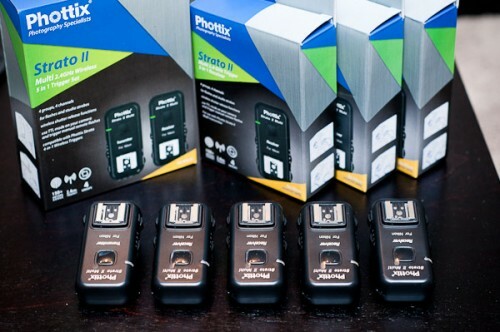 But too bad, I had already ordered a new set of wireless triggers from Phottix, known as the Strato II. At the time, the Cactus V5 Wireless Trigger was out and featured a transceiver type design found in the higher-end wireless triggers such as the PocketWizard Plus II, but costing nearly a quarter of the price of the PocketWizards. With a transceiver design, each unit can act as both a transmitter and a receiver, hence the term transceiver. The benefit of a transceiver design is that when a unit fails while on a shoot, you could easily replace the faulty unit with any other unit. This is a big improvement from the older Cactus V4 design, which featured a separate transmitter and receiver units. Another benefit of the transceiver design was the availability of a hot shoe which could be used to attach a flash while the ‘transmitter’ was mounted on the camera hot shoe. This was my biggest gripe with the Cactus V4 because I wanted to be able to trigger remote flashes, while still keeping a flash mounted on top of my camera. The Cactus V5 solved that problem for me. However, there was one problem: The Cactus V5 did not transmit TTL information from the body to the flash if there was a transceiver mounted in between the two. For my casual event photography, this was important to me. I wanted to have 2 remote flashes pointed at the dance floor and another flash on my camera body for artificial light. While the cactus allowed me to do this, albeit in manual mode, I wanted a solution that allowed for TTL pass through while the flash was mounted atop the wireless transmitter on the body. In comes the Phottix Strato II Multi 5-in-1 Wireless Flash Trigger to the rescue. It features wireless flash triggering with the ability to pass through TTL information if the flash is mounted on the camera. This is exactly what I needed. However, the unit is not a transceiver type design like the Cactus V5s allowing you to use any of the modules as a transmitter or receiver interchangeably. The Phottix Strato II features a separate transmitter and a separate receiver module. The disadvantage of this design is that your entire flash system has a single point of failure, your transmitter. That being said, the Phottix system is priced significantly more expensive than its Cactus counterparts. At nearly twice the price, one would expect the system to be reliable in both longevity and triggering. My decision to purchase the Phottix Strato II was based solely on the pass through TTL feature. The transmitter and receiver units appear to be solidly built and the plastic feels to be quite thick, relative to the feeling I get when holding the Cactus V4 triggers. The hot shoe of the transmitter is metal, while the rest receivers were given a molded plastic shoe. The Photix Strato II provides both a channel (1-4) and zone (A-D) selectors. The channel selector is useful if other photographers are using the same triggers or there are interfering equipment nearby running on the same radio frequency. The zones allows you to control which zones fire when the zones are turned on from the back of the transmitter. I also use the zones to keep track and label my receivers. Since I have four receivers, each of my receiver is in a separate zone. I use try to rotate my receivers as frequently as possible to avoid prematurely aging the components of just one receiver. The zones also allow me to setup all my strobes throughout my scene and then selectively turn off certain strobes as I try to achieve a different effect. Finally, the range is more than adequate for my needs. I was able to fire my flashes from a distance of 140-ft away, which is plenty far enough for most photographers doing local strobist work. I can understand wedding photographers needing more range to light up the dance floor in a larger venue. The Phottix Strato II receivers (for my Nikon) is a great piece of technology for any photographer. I don’t personally see the need for more expensive PocketWizards as my early tests have proven that the Phottix units can fire reliably 100% of the time. If you are in search for a wireless trigger, I don’t think you can go wrong with the Phottix units, or any of the other low-end units for that matter. It is best that you understand your needs and pick the features that works best for you. For me, it was important that I had a hot shoe TTL pass through. For others, having the flexibility of a transciever design or universal use (Canon, Nikon, Pentax) might be more important for you. I came across this page via a Google search for using the Cactus V5 with Nikon flashes. I had the same issue that you describe, and use flashes in a similar way – large strobes acting as area fill lights or accent lights but using an on camera flash as the main light (either a SB80DX or a SB800). I typically have my transmitter mounted on the flash itself. I have a plastic accessory shoe attached to my SB’s via zip-ties, it’s not attractive but it works great. I’ve only previously used Pocket Wizards and the Power Sync 10 units and both work great connecting the transmitter to the SB flash via a PC to mini plug cord. Using this same connection configuration results in a failure with the Cactus V5’s, in that the Cactus overrides the SB and then the SB doesn’t work properly or doesn’t work at all. If I place the Cactus on the hot shoe with the SB mounted on the Cactus, it works in Auto or Manual modes only, but this also loses the auto ISO and zoom sync, which is completely unworkable. So just by sheer luck of dredging up a bit of old memory, I recall that the camera body also has a PC port, which I don’t think I’ve ever used. This is on a D2X. So, I put the SB on the camera hot shoe in TTL mode as usual, with the Cactus mounted on the SB and ran a PC cable from the body port to the Cactus – VOILA! it all works as it should. Unbelievable. So somehow there’s a design flaw in the Cactus, or some design in the Cactus that makes no sense at all. I was actually researching the Phottix product based on your blog and other radio slaves when this “brainstorm” occurred. So, hats off to you – in some way you got me to find the solution! Best wishes and happy shooting, but sorry I’m a couple months late with the info.